I’m reporting in from New York City and am delighted to report that when I return home to San Francisco this evening, I’ll be toting an award with me. At yesterday’s MIN Editorial & Design Awards ceremony, “Polaroid’s S-70: The Art and Science of the Nearly Impossible,” an article I wrote in June, won for best online feature. We were in distinguished company–other publications which were honored included TIME (yay! ), Sports Illustrated, Harper’s Bazaar, Esquire, and Better Homes and Gardens. And The Rotorian won in an amazing ten categories. You can read more about the awards and see the complete list of winners here. Over at the New York Times, Christopher Bonanos has a nice piece comparing Steve Jobs to the entrepreneur/technologist he resembles most by far: Polaroid’s Edwin Land. Bonanos says that virtually none of the Jobs obituaries mentioned Land, but I remembered to do so in my piece for TIME–in the third paragraph, in fact. And last June, when I wrote about Polaroid’s SX-70 camera, I found the Land/Jobs parallels so compelling that they threatened to take over the article. Remember Polaroid? That Company That Made Unsanitary 3D Glasses? Before Edwin Land invented the instant camera, he invented synthetic polarizers. He realized in the 1930s that one application of the technology would be 3D movies, but it wasn’t until 1952 that the idea took off–and only briefly at the time. In its May 16th 1953 issue, the New Yorker published a story on Polaroid’s 3D glasses and concerns over whether they were unsanitary. 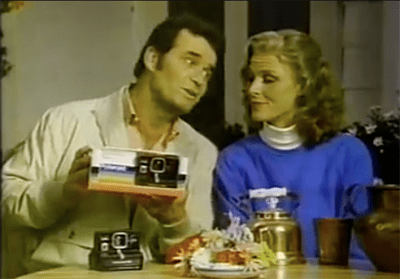 Polaroid had been selling instant cameras for five years at that point, but they didn’t merit a mention in the story–Land was apparently still more famous as the polarizer guy. If you replaced the references to Polaroid with RealD and the one to Bwana Devil with, say, Thor, you could practically republish this story today. Fifty-eight years later, people are still freaking out over germy 3D glasses and figuring out ways to disinfect them. And hey, I just learned that Polaroid Eyewear–a separate company from the current version of the Polaroid that sells photography-related stuff, but descended from the original Polaroid–is selling 3D glasses all over again. What makes a gadget great? You might argue that it’s determined at least in part by how many lives the product in question touches. Back in 2005, when I helped choose a list of the fifty greatest gadgets of the past fifty years, we ranked the Sony Walkman as #1 and Apple’s iPod as #2. Fabulous gizmos both; I suspect, however, that they wouldn’t have topped the list if they hadn’t been bestsellers of epic proportions. The SX-70–specifically, the SX-70 which I bought at an antique store in Redwood City, California in April of 2011. But greatness isn’t a popularity contest–not primarily one, at least. Maybe it has more to do with the concept expressed by Arthur C. Clarke’s Third Law: making technology indistinguishable from magic. By that measure, I can’t think of a greater gadget than the SX-70 Land Camera, the instant camera that Polaroid introduced in April 1972. We ranked the SX-70 eighth on that 2005 list, but the sheer magnitude of its ambition and innovation dwarfs the Walkman, iPod, and nearly every other consumer-electronics product you can name. The conventional wisdom at the moment about Steve Jobs’ medical leave seems to be that Apple is in solid shape to flourish indefinitely without him. Here’s an interesting opposing view from my friend Phil Baker (who’s guest-blogging for Jim Fallows at the Atlantic). Phil draws a comparison between Apple and Edwin Land’s Polaroid–and he has every right to do so, having worked both for Apple after Jobs left the first time and for Polaroid in the Land era. Progress–to swipe an ancient General Electric slogan–is the technology industry’s most important product. Its second-most important product? That’s easy: blunders. In fact, you could argue that the two are inextricably intertwined. An industry that was more uptight about making mistakes might be more cautious and therefore less inventive. It’s also sometimes difficult to tell where progress ends and blunder begins, or vice versa. If you believe that Google Wave was a bad idea in the first place, you might think it was smart of Google to kill it this year–but if you thought Wave had promise, then it’s Google’s early cancellation that’s the gaffe. All of which is a roundabout way of saying that while the industry’s lame moments are…well, lame, they can also be important. Last year, I summed up a decade’s worth of tech screw-ups and came up with 87 examples. This time around, I’m covering only a single year–but I found 57 items worth commemorating. No, tech companies aren’t getting more error prone; I was just more diligent. And as usual, there was plenty of ground to cover. The more you love Polaroid, the sadder it is to see its name slapped on products like this.